This weekend I got a chance to do a bit of Parkour, or Freerunning, with a friend also interested in it. Now at first glance (see video below) you may think it’s a bunch of idiots trying to break their legs acting like monkeys, but, yeah, it’s actually much more. 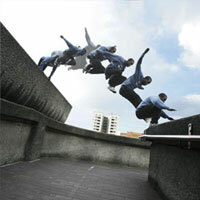 I would define Parkour as a way of moving through your physical environment without slowing. My brothers and I basically did this growing up, chasing each other across the wooded cliffs and riverbeds of the Shawnee National Forest, but we never had a name for it. Now it’s something I do for exercise. It’s more fun than running and less dangerous than sitting in a cubicle. You need a happy medium. When your running as fast as you can at a stair railing or a bunch of rocks you gotta think pretty quickly what you’re going to do to get around them. Like what are you gonna do if someone is chasing you with a bat. Now, SolidWorks isn’t as life threatening, for now, but, you know, you have to figure some things out pretty quick even if you don’t know what’s coming or how you’re going to progress until you get there. This is one of the funnest activities I’ve ever done and I find that when I’m really tested against my surroundings at work in completing a model or a redesign is when I enjoy that part of work the most. It’s not one of the hokey feel-good mindsets. You don’t have to force yourself to be aware of every instance. It’s happening faster than you can think and you kinda realize it because you feel confident you’ll know what to do. But there’s one thing needed. Lot’s of it. This weekend was particularly painful because I haven’t done some of those things in awhile. We did runs where we took turn following each other getting over and around anything. The concept being, when you put yourself into a situation you limit yourself. Whereas, when someone else puts you in a situation you have to perform or stay home. Once you face it, your flying over obstacles (redesign, modeling errors) and not even losing a breath. It feels super cool and, even more, you get to show someone else how it’s done. I can’t wait to get out the next time. If any of you are in to Tulsa area, let me know. Can Flavored Coffee Make you Work Faster?